I have to admit to you all that I am becoming very annoyed with a family member close to my heart. Everything I want to cook he just doesn’t eat. I’m sick of working around his long long list of dislikes. I am not sure what to do about it. Sometimes I just cook things that he never eats. Someone else would probably love to eat some of my delicious food….and sometimes they do. But I just don’t have time to keep putting them in the car and driving them round the neighbourhood like a small lost child. 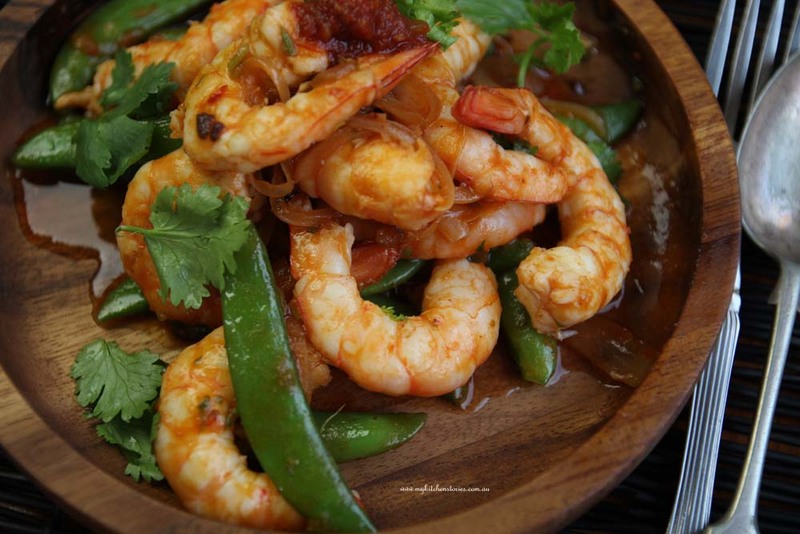 I had a small win this week when he took a nibble of the Summer Prawns with Hot Lover Sauce and declared it very nice….if only he were hungry. Suffice to say I feasted on Prawns and had no regrets or leftovers. I’d imagine it is a recipe for two at other times. So what you may ask is a Hot Lover Sauce?. Ok it’s a sauce that was sent to me by Roza’s Gourmet Sauces. I wanted to write a recipe with a couple of their products because they are going to feature it on their website. I found it hard to find a flavour I wanted to cook with that he might like. So, I chose this Hot Lover Sauce that I cooled down with coconut cream. After all, this is the quickest tastiest recipe you could have for any week night….or even if you had someone over. I don’t often use pre-made ingredients but sometimes you find good ones like these that are fresh, preservative free and gluten free. Years ago, as a food buyer, I met Rosa at a food show and I stocked them in the store so people could see how fresh and natural they were. Roza was a lot like me, in that she loved cooking, she had a real passion for it and after being continually asked for her recipes, she started selling jars of fresh sauces from home in 1991. This grew into a lot of sales and she eventually had to move into commercial premises. She was a pioneer in the fresh sauce market, especially in Queensland where her daughter, the lovely Jasmin, now runs the business. There are more than 40 sauces and condiments mostly made sugar free by using honey in place of sugar to sweeten. There are lots of vegan and dairy free options too, ok, enough of my blabbing because here come the prawns. So if you can imagine the sauce I am using contains tomato, onion, bush honey, white vinegar, garlic, olives, gherkins, habanero, ginger, basil and curry powder; it works so beautifully with rice and coriander and takes a mere whisper of a minute. You will have sauce left over to use on steaks burgers, sandwiches or even mixed with mayonnaise to make another dressing. Cook Jasmine rice and set aside. Have everything ready to cook the Prawns. Heat the fry pan nice and hot and add the oil and the onion and toss till just starting to wilt. 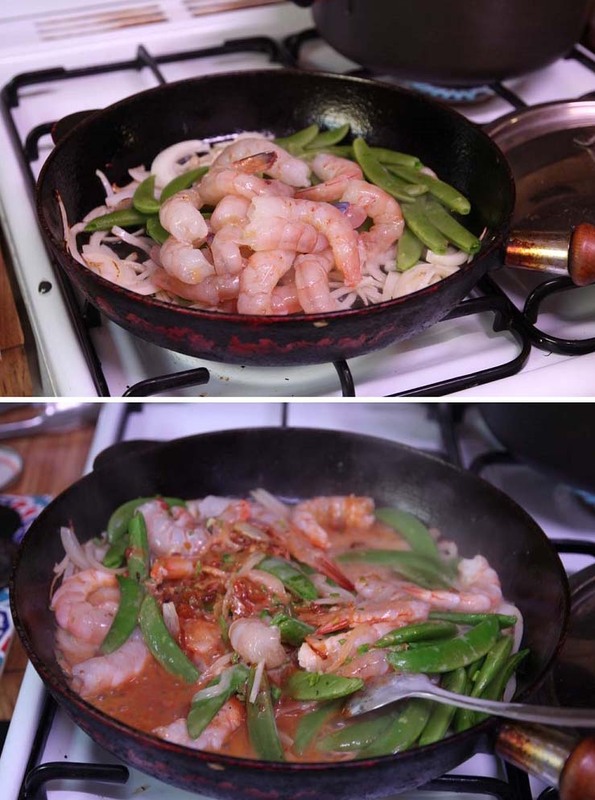 Stir gently till the prawns start to turn pink. The peas will cook just enough to be crispy and blanched. Don't let it cook on a high bubble. This will burn and reduce the sauce too much and overcook the prawns. When they are no longer transparent they are cooked. The cooking should take about 6-8 minutes. Toss through the coriander leaves and serve with rice and extra hot sauce. This isn't a very hot dish, due to the addition of coconut. If you want a hotter sauce add more of the Hot Lover Sauce. Fussy eaters can be such a pain. At least you had some kind of breakthrough with these prawns. They look delicious! Is this fussy eater the result of your genes? p’raps? My son was a fussy eater until he was 25. Hot lover sauce? If ever there was a product designed for me, this is it. What a lovely dish! I know I would love every single bite of this. 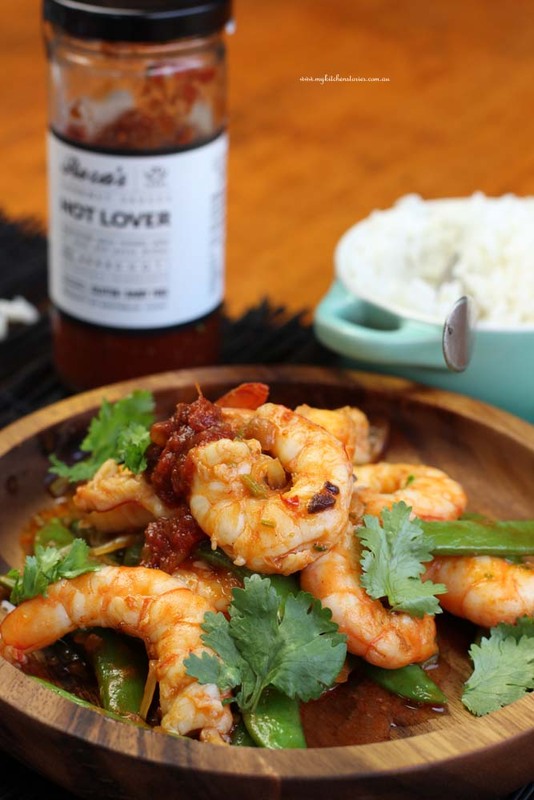 The Hot Lovers sauce sounds like a perfect combination of gorgeous ingredients…I am off to check out the website. Poor you! My heart goes out to you with a ‘family member’ who has a list of things he doesn’t like – espeically when you are such a wonderful cook! But this sounds great – ideal for this weather. 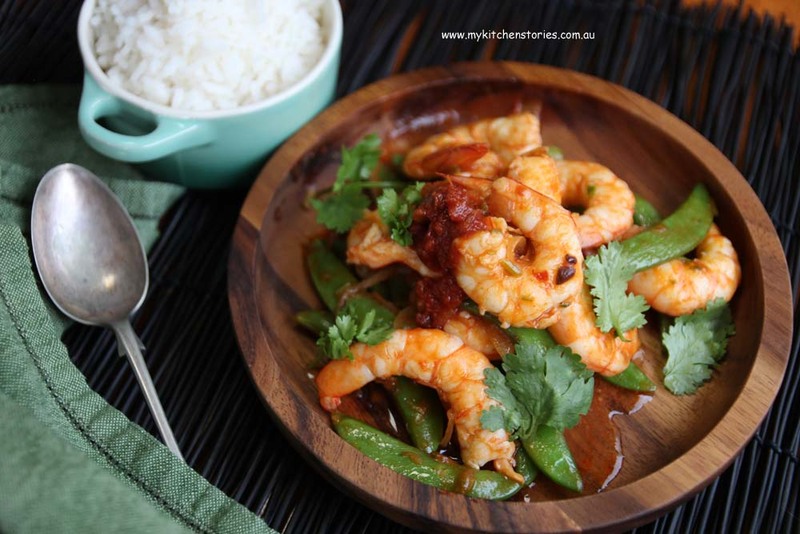 I have a son who works on a prawn trawler in the Gulf (NT) and he brings home 10kg (frozen) tiger or banana prawns at the end of the season so this dish would be perfect. But I have not seen this product “Rosa” before (and love the name ‘Hot Lover’ sauce). 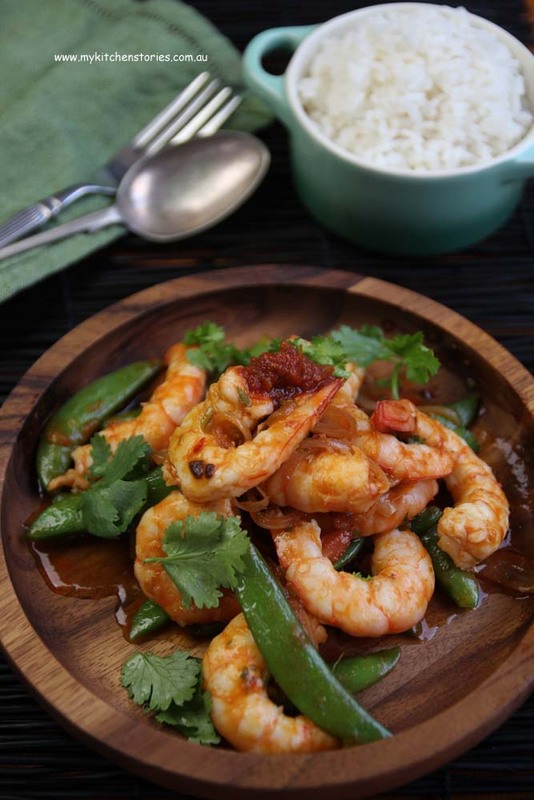 nothing beats prawns with a flavoursome sauce! I just can’t with fussy eaters. I feel for you, it can’t be easy especially when you make such delicious food as you do! I feel like I’ve left comments all over the blogosphere about this recipe! I love it….especially because I am in a “Valentine’s” frame of mind, trying to come up with romantic recipes….and this sauce is just PERFECT, right?! I will come and live at your place and eat all of your delicious food. Let’s start with this recipe. Oh that sauce sounds delicious! I would happily eat all those prawns to myself too. I have a thing that if people choose to be fussy then I’m not going to fuss over it… If they’re hungry enough they’d eat what I dish up… Good luck. 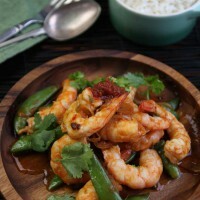 These prawns look excellent and what a lovely sauce to have with them. Fussy eaters can be painful – our families are lucky we love them.